Every year, thousands of charity golf outings take place across the country to help support many of worthy causes. The format of these events is often quite similar, highlighted by a closest to the pin contest, a longest drive contest or maybe even a hole-in-one contest. For the past decade, SMT Events from west suburban Oswego has been working to change the face of golf outings by incorporating fun and unique games and activities. Their efforts have helped hundreds of local charities raise over $13 million during that time period and have built a growing audience of raving fans for SMT Events. Now SMT Events is once again looking to turn the world of golf outings upside down with the announcement of their most recent concept, the Birdies or Better Pledge Drive Golf Outing that will take place on Wednesday, August 28th at Ruffled Feathers Golf Club in Lemont. Think a walkathon for golf where players secure pledges from friends or family for each birdie that their four-person golf scramble team can score. 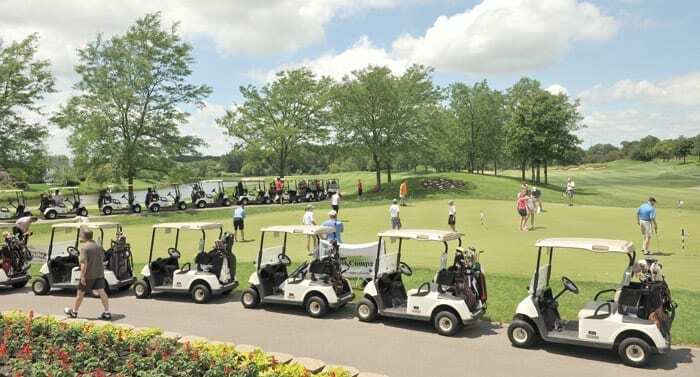 Unlike most golf outings that have a single designated charity, the Birdies or Better Pledge Drive Golf Outing allows each four-person team to select their own designated charity. Up to four teams from each charity can participate. 100% of the pledge money secured, minus credit card fees, goes directly to the designated charity for that team. Pledges are made online and the winnings are sent directly to the designated charitable group. The cost to play in the Birdies or Better Pledge Drive Golf Outing is $640 per foursome, which includes golf, food, prizes and more. SMT Events anticipates most of the charitable groups will invest the $640 to give their selected team(s) the opportunity to provide a significant return on investment. How much of a return depends on how well their team plays. For example, if a four-person team raises a total of $1,000 in pledge money per birdie, and they tally 8 birdies, their charity will receive roughly $8,000. If the charity has four teams registered in the event that post similar results, that charitable group will receive $32,000. To help incentivize pledges, any individual who pledges $10 or more will receive a $25 gift card to Ultimate Golf and will also be entered into a drawing for one of three Las Vegas or Reno vacations. SMT Events believes this new charity event format could be the future of golf outings in the United States. To register call 888-693-4001 x1 or email info@smtgolf.com. The Birdies or Better Pledge Drive Golf Outing that will take place on Wednesday, August 28 at Ruffled Feathers Golf Club in Lemont.